Did you know your computer screen is not calibrated? This is true in every case unless you have proactively calibrated your monitor for printing. You may think your screen is correctly showing your image's tones and colors but if you don't have a calibrated screen it's a role of the dice on color accuracy. 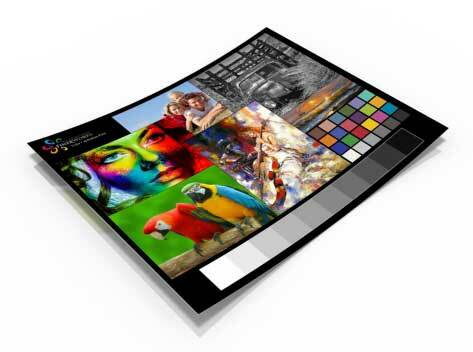 Because the printer is seeing the true color values in an image it is printing rather than what a monitor shows, those colors have the potential to be slightly in accurate. This means colors may be a shade different, your print looks darker than expected or it lacks the contrast you thought it had. This is not because the image was printed wrong but because you were not able to see what the image really looks like. A solution to this is to calibrate your monitor. The color calibration print does not necessarily calibrate your screen but it it least provides reference print you will want to try to match your screen to. Once this has been done you can see if your file needs some adjustment to bring it closer to the standards a printer expects. Prints being too dark is the most common issue people experience when printing at home or through a professional lab. This is almost always due to incorrect monitor settings which imply the images are brighter than they truly are. This leads to people printing or sending images which are actually darker than their display shows. Many color labs offer corrective measures for this however ideally you will want your images to be as accurate as possible before you submit them. Important: The calibration print DOES NOT calibrate a monitor to ICC standards which is required for soft proofing. In order to soft proof you will want to have calibrated your monitor with a monitor calibration device. Download a copy of the Color Calibration Print (PDF) (click here for older version) and use it to compare with the print you received in the mail. Hold the print up to your computer monitor while viewing the downloaded copy. Make adjustments to your computer monitor's color settings. If you are not sure how to do this please consult your computer's manual or have someone with general computer knowledge help you with this. Once you have made the appropriate adjustments to your computer monitor, images displayed on your screen should be displayed in a more accurate fashion. Use the gray scale strip as a reference to check if your screen is too bright or too dark. The strip consists of a number of gray scale patches starting with white and ending with black. Each patch starting from white should get consistently darker on your screen. Adjust your screens brightness level until you can see all the patches from white to black. When looking at your calibration print try to view it in as natural a light as possible. Adjust the color settings on your screen by trying to match as many colors you see as possible. While you migh find it difficult to match every color exactly, simply getting in the ballpark will go a long way. Overhead florescence or incandescent bulbs can have a dramatic impact on the perception of colors and cause colors to shift or appear slightly different. Blues tend to shift the most and people sometimes think the blue in the print is too purplish when viewing under florescent lights. Sunlight, even on a cloudy day provides the best and most accurate viewing circumstance. If you sometimes print images on your inkjet printer at home and are concerned about prints we make looking the same, one thing you can do is print the color calibration file on your favorite inkjet paper you use for your home made prints. Compare it with the calibration print you ordered. Depending on the type of printer you used, paper and and your printer or print software settings you may or may not see a difference. In general, assuming you have a decent inkjet printer, you should see a similar output. Some differences are possible since we use an advanced printing software and color management based on industry color standards. When you adjust your monitor to try to match the calibration print, it should bring you into what we like to call "ballpark" accuracy. This way when viewing your images on your screen they are more into sync with what printers output. It's hoped it will bring your monitor closer to ICC standards which is the standards we adhere to when printing. Based on that, It really does not matter which calibration print you choose. They are fairly consistent across all media types. Any slight differences in hue would likely be near impossible to adjust to for most people. It just brings people a lot closer to it without the aid of a relatively expensive ($70-$200) monitor calibration device.